They have much in common and yet they refuse to see it. They each worship violence and hold true to a belief system that dictates they are always right and everybody else is always wrong...and yet they fear showing their faces or having their identities found out. Cowards all who might say the words or even physically act out, but words alone and actions taken do not mean they have the needed courage to stand strong by their own convictions. And those convictions are such of the unrighteous for the righteous do not hide behind masks or hoods in an effort to hide who and what they are. And these unrighteous of which I speak are really all those on the side of the alt-left no matter that some claim they are the alt-right. But know that no matter what they call themselves, together they compose a new faction of terrorist...as in political terrorists all. 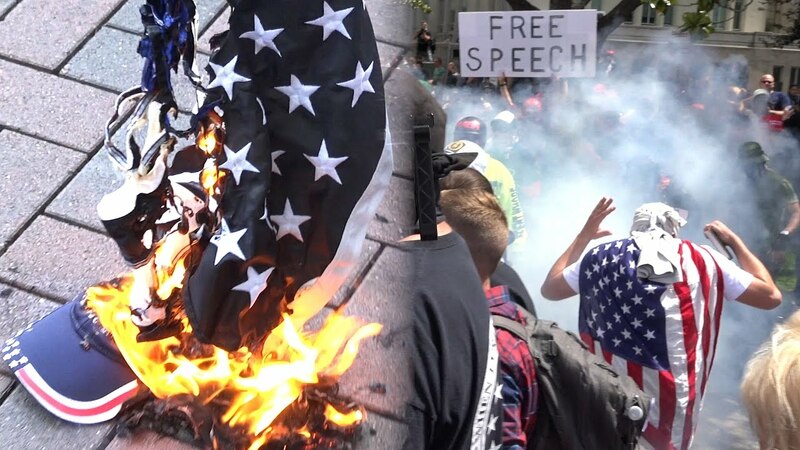 Both far-left Democrats and far-right Republicans one and the same tied together by hate, as even their individual actions mirror the individual actions of the other with both screaming threats of violence against our government...with both screaming death to our president and all who support or defend him. 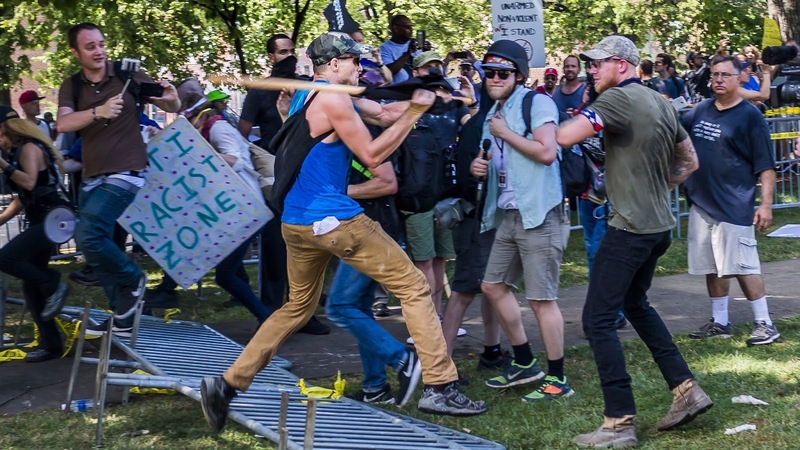 Violence unleashed and violence misplaced...and now that violence uses as its touchpoint statues... mere objects of stone, wood, metal, or cement... inanimate objects now taking on a life, if you will, of their own, and claiming to do so in the name of racial equality that is anything but. 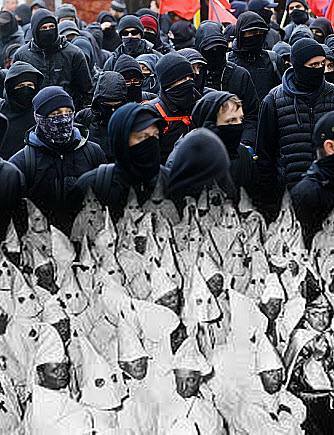 Antifa, Black Lives Matter, and even the Ku Klux Klan...the infamously Democrat-birthed hate group pretending to be far right but who really are far-left, seem to be focused in on statues representing America's past. Confederate statues and monuments honoring a war and men that divided our nation in hate...brother against brother...friend against friend...even father against son. Hate turned into a war dripping in the blood of those on both sides...a war fought by whites defending blacks...a war fought by whites wishing blacks to remain beasts of burden to serve them until dead. 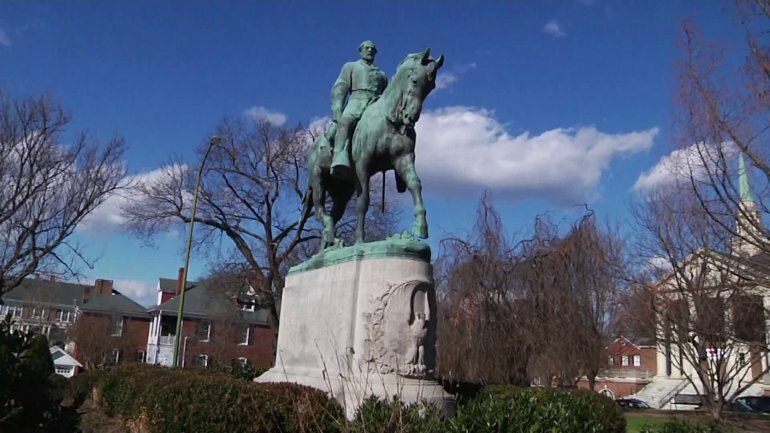 And now symbols of that war fought long in America's past...symbols of generals and battles both won and lost...symbols dressed in the guise of statues...statues but one part of our collective American past...statues now becoming ground zero of hate so completely out of control. And while those statutes have stood in parks and fields and even as monuments leading into our courthouses and such...and with so many having stood uncontested for a century or more...now suddenly those very same statues have become evil personified and must be either taken down, relocated, stored away, or outright destroyed. 'Rules for Radicals' now coming to life by both sides of these hate mongers who are using tactics not only to cause contention and mischief, but are using tactics that are the calling card of the ultimate hate group of all...ISIS. 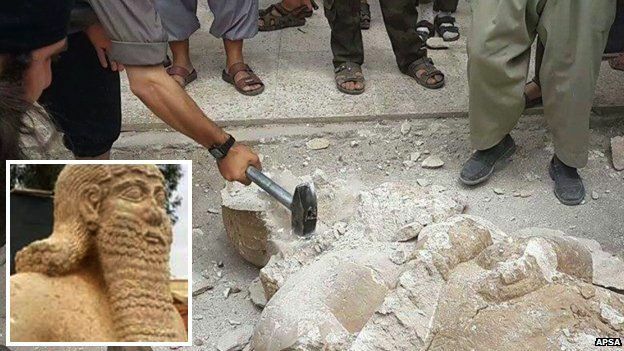 Statues broken, statues blown up...statues that stood for ages in the heart of the Middle East...statues that told a history ISIS did not like...statues they alone found offensive to islam and to allah...statues and even ancient remains of cities now forever gone...physical reminders of a past whose ghosts and shadows will always remain for that which existed can never truly be erased. 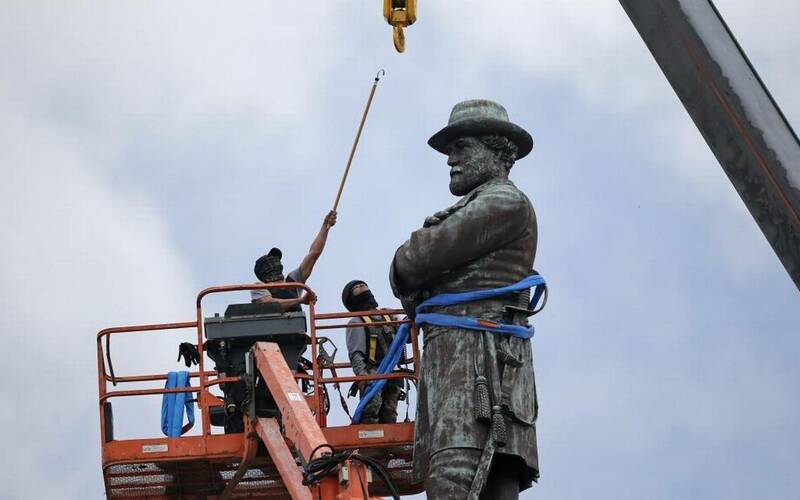 And now Antifa, Black Lives Matter, and other black-hate groups are doing exactly what ISIS did as they zero in on and deem Confederate statues offensive to people of color and that what is offensive to them must be torn down. Thinking that if you cannot see a reminder of a sad part of America's past then that part of America's past never existed, but in their thinking they are actually doing their ancestors a great dishonor for in their erasing the memory of their ancestor's backs broken amongst their collective tears and blood shed...history itself is not erased...it just has a sheet thrown over it. A sheet not unlike that worn by their fellow compatriots in hate...as in the Ku Klux Klan...who think that a sheet can cover and hide what is fascism of the white kind. And do not for a moment think that all the black hate against any and everything white is not fascism as well, for while their color might be different, haters who are intolerant of anyone who disagrees with or are different than themselves are the epitome of fascists for they, like fascists of the past, want to suppress their opposition by any and all means at their disposal...fascism 101. But know above all else that the tearing down of statues is neither the black-haters nor the white-haters (who but pretend to violently oppose such actions) true goal, for both groups are anarchists in their own way who are focused upon garnering the same ultimate prize...a prize of erected to themselves a statue of victory for their tearing down the very foundation upon which our nation was built...a foundation that “all men are created equal”...a foundation of “liberty and justice for all." And if they succeed in that goal our beloved America is lost to the haters on both sides of the always colored political aisle....black-haters pretending to be outraged over injustices now relegated to history books and to the passage of time...white-haters turning the black-haters hate around into violence of their own and doing so while challenging the others to do something about it...to cross 'red lines' if you will. Violence begetting violence and the circle of hate is complete while both sides forget that the sins of the past via visual reminders like statues and monuments, actually help to serve as reminders of how far as a nation we have come...help serve to remind us to 'never forget' the sins of our fathers...for forgetting means history will surely repeat itself...and this time the cost of forgetting will be much worse than was all the slave blood shed. Again using a blueprint set down by ISIS...the very islamist killing machine that has brought mind control and brainwashing... coupled of course with the spilling of much blood...to an almost if not daily highly effective occurrence...our country will soon become immersed in a racial war so intense that a collective madness of sorts...a madness of true submissiveness to do what you are told for fear your life could be forfeited for the common goal...will overtake both sides of the color-charged, hate-group spectrum. And the same red blood that courses through all our veins will run through America's streets unfettered both by copycat killers and by a government who can do little to nothing to stop it short of declaring martial law forcing the killing of fellow Americans who dare to breech this sad new reality of hate run amok. A truly misplaced and misguided blueprint for war from those on the black side still hungry for the blood of and reparations from self-perceived white task masters who never were...while those on the white side remain hungry for the blood of those trying to lord over them what was but no longer is...both sides forgetting how far we as a nation have come in matters of race. But how far we have come does still fall short of equality not for the black man who the media and kumbaya sorts always seem to give a free pass to for both violent actions taken and for so many words of incitement spoken no matter how many innocents and guilty lay dead...but equality for the white populace who are being held hostage to the will of those who can neither let go of the past nor who have the desire to move forward on their own. 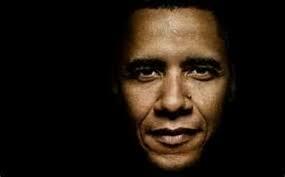 'Whitey' is still needed but on the blacks-haters terms alone, and while the white-haters have every right to say 'no' to their demands, they have no right doing so via violence initiated or blood shed...nor for that matter do white politicians still promising more 'free stuff' in exchange for black votes. And all the true progress made...and know that progress can be seen in the numbers and the percentages of blacks who do not belong to, sympathize with, or support black-hate groups... numbers that show that while hate groups in total have sadly risen by 17% to more than 900 strong since 2014, the number of neo-Nazis and white supremacy hate groups have actually been steadily declining not increasing in numbers..proving for all with eyes open to see that this ongoing hate and ensuing violence with blood shed is indeed media generated, most probably George Soros funded, and surely Barack HUSSEIN Obama initiated as payback for denying him...via Hillary Clinton...his third term in office. And what better way to do so than to use the very black people he claims as his own as expendable pawns in his game of revenge. So are we as many claim becoming a country now on course for racism to become a permanent part of who we as Americans are...to that I think not...for the bottom line is that save for a few racism is not a part of the fabric of our American society. Racism is taught not innate and as such racism can fade away on its own if only the media would ignore the actions of a few and concentrate more on the actions of the many, especially if we together view the future with optimism instead of with hate. 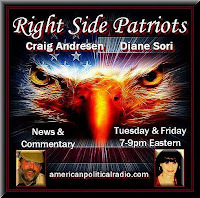 Today, Tuesday, August 22nd from 7 to 9pm on American Political Radio, RIGHT SIDE PATRIOTS Craig Andresen and Diane Sori discuss race relations in America today, and important news of the day.